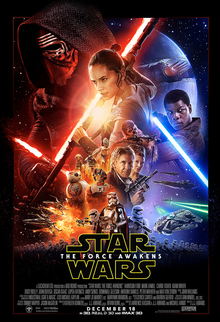 Review: Star Wars: The Force Awakens – Star Wars! nuthin’ but Staar Waars! Star Wars: The Force Awakens is finally out. This is truly the most anticipated movie of the year. Now that the world has been given ample time to watch this film, here, we, go! The Force Awakens takes place about thirty years after Luke became a Jedi and the second Death Star was destroyed. Now he’s disappeared and the First Order (what became of the Galactic Empire) and the Resistance (backed by the Republic and led by General Leia) search the galaxy to find him. This entry was posted in Movies/TV, Reviews and tagged Adam Driver, Andy Serkis, anthony daniels, Carrie Fisher, Daisy Ridley, disney, Domhnall Gleeson, harrison ford, Iko Uwais, J.J. Abrams, John Boyega, Lawrence Kasdan, Lupita Nyong’o, Mark Hamill, Max von Sydow, Michael Arndt, Oscar Isaac, Peter Mayhew, star wars, star-wars-the-force-awakens, the raid, Yayan Ruhian on December 22, 2015 by Eugene. 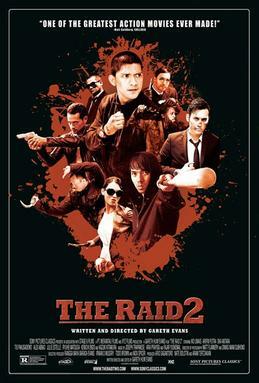 The Raid 2 is the sequel to The Raid: Redemption. We pick up almost right after the events of the first movie, Rama’s just gotten back from surviving that apartment complex, he then meets up with this other older cop who’s trying to find other dirty cops. So they send Rama on this deep undercover mission to infiltrate a criminal organization. Sounds simple enough right? Like the first one? The good; as always, the (Indonesian) martial arts is top notch. Iko Uwais is great, his level of skill is fabulously displayed in this film. And they add more artists to battle him, unlike the previous movie where we basically just had Iko fighting everyone, only to lead up to a “boss,” played superbly by Yayan Ruhian. Yayan appears in this movie too, but he’s playing a different character. Still, good to see him here. The color palate of the film is great. The colors are very muted, not just with the color correction of the film, but with the set design and the costume design. There are a lot of black suits worn in this film, along with dark colored clothing, like in the prison where everyone is wearing a grey jumpsuit or a black police uniform. Another thing to note about the prison are the grey walls, especially in the bathroom fight scene. Then there’s Rama’s apartment, even the walls are grey, not the typical white, but grey. Most of the vehicles used in the movie are also black sedans or black SUVs. I just love the absence of color, makes the blood pop more, and emphasizes the grey area that Rama’s got himself into. There are wide shots, lovely lovely wide shots! thank you for including these. This is a shot choice that goes underutilized today. The bad; this movie is way too long. It clocks in at 2.5 hours… wow. It totally did not need to be this long. I get it though, you want to show case the exceptional martial arts and artists, but you have so many to service here. I hate to say it, but Yayan’s character in the film was sort of unnecessary. The “boss” fight with the bat boy and the hammer lady was cool, but the stuff in-between with them could’ve been shortened. The story is way too complicated for a film to showcase action. The whole undercover thing is a true macguffin in the sense that it served to move the story along to get to other parts of the movie… namely the action. Overall, if you like martial arts, you’ll enjoy this movie. If you like action, you’ll enjoy this movie. They cover the action very well, much better than most America movies. The last action scene comes to mind, well the beginning of the last action scene. Rama shows up at the bad guy’s headquarters, a restaurant, and enters guns blazing. Think The Matrix‘s lobby shoot out scene, but with out firearms, Rama goes in with his “guns” and just beats the crap out of everyone that tries to stop him. It’s a real sight to behold. So we have good action and great coverage, but the story and the film length need to compliment them. It really feels like a missed opportunity at a great movie. This entry was posted in Movies/TV, Reviews and tagged action movie, indonesian martial arts, martial arts, movie review, the raid, the raid 2 berandal, the raid 2 berandal film review, the raid 2 berandal movie, the raid 2 berandal movie review on May 2, 2014 by Eugene.